Seventeenth-century Venice witnessed spectacular musical developments, from the polychoral liturgical motets of Gabrieli to the establishment of Europe’s first competing professional opera houses (Cavalli etc). Another aspect of north Italian musical culture during the seicento is the small-scale sonata for solo treble instrument and basso continuo accompaniment. 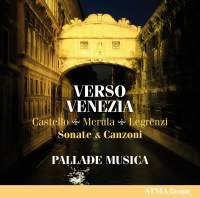 Pallade Musica perform sonatas or canzonas by three different composers who had varying degrees of association with Venice. Giovanni Legrenzi (1626-90) worked in his native Bergamo and Ferrara, and eventually got the top job at St Mark’s. His sonata La Galini illustrates a compact idiom distinct from the florid divisions of the earlier pioneer Dario Castello, a cornettist and leader of the wind ensemble at St Mark’s Basilica, whose two collections of sonatas were published in 1621 and 1629 respectively. Constructed on contrasting tempi and moods, Castello’s pieces were advertised as Sonate concertate in stil moderno in order to make it clear that these were essays in a new elaborate style. The emotive contrasts and technical demands of these diverse sonatas are exploited adroitly by the violinist Tanya LaPerrière, whose fantastic bow work and expressive freedom function in rapturous dialogue with cellist Elinor Frey. Theorbist Esteban La Rotta and harpsichordist Mylène Bélanger provide expert realisations, and the quartet conjure a kaleidoscope of colours, adventurous spontaneity and imaginative continuo realisations in Castello’s Sonata prima from the 1629 set. The occasional use of organ as an alternative texture works wisely, such as in the dance-like canzons La Cappellina and La Scarinza by the Cremonese organist and violinist Tarquino Merula (c1594-1665), published at Venice in 1651.